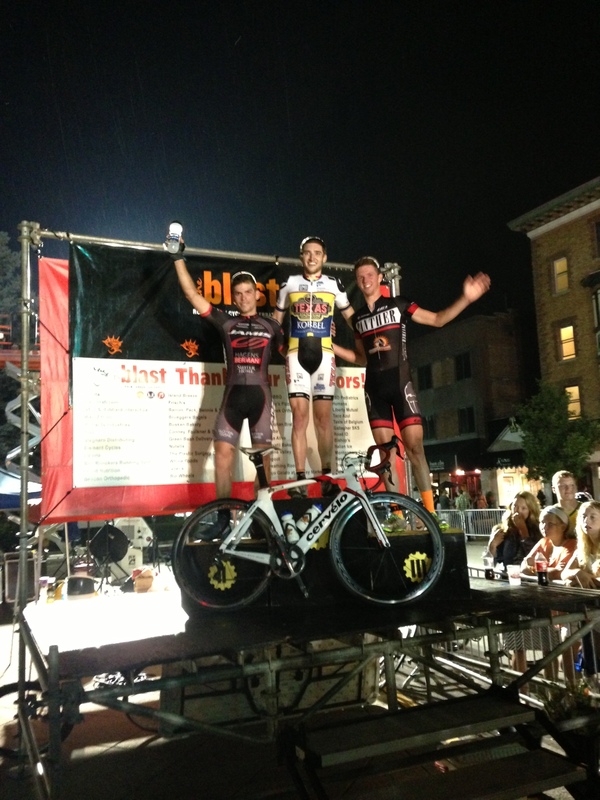 Colton Barrett wins Big at the Tour of America’s Dairyland! “In the Men’s Pro Race, rain started to fall from the gun, making for less than ideal brake-squeaking conditions. Ninety-six riders at the Start Line, just 46 finished, most opting instead early on to watch the race safely from the barricades. Roughly 30 minutes, a legit break of Alexander “ARay” Ray (ISCorp-Intelligentsia), Colton Barrett (Texas Roadhouse) and yellow jersey Ricardo Escuela (Predator-Carbon Repair) formed. ISCorp’s Aray drove the pace early on but ARay and Barrett (Texas Roadhouse) shared the brunt of the heavy lifting throughout the race. As the gap continued to build to nearly 45 seconds, the break was just 15 seconds out from lapping the field at one point. Barrett’s attack with 25 to go was short-lived. Even with Escuela’s (Predator) fall into turn two at 18 to go, ARay and Barrett couldn’t manage to shake Escuela during the race, as he jumped right back in to rest third wheel. A break of six started to splinter from the field with 13 to go, and Ricardo Van der Velde (Jelly Belly) continued to lead that charge after picking up a prime but with a 31-second gap at six to go, Barrett (Texas Roadhouse) attacked again, overpowering ARay (ISCorp) and Escuela (Predator). ARay (ISCorp) and Escuela (Predator) duking it out with the field screaming behind, it was Escuela in second; ARay third. Escuela stays in the yellow Overall Leaders Jersey for another day, 27 points ahead of ARay. Tour of America’s Dairyland continues Saturday for the penultimate day of racing at the ISCorp Downer Classic presented by Intelligentsia Coffee. If the rain clouds get distracted, tens of thousands of spectators are expected for this fast course, maxed field, heavy prime day. Last year, over $6,000 was given away to one Pro rider during the Ben’s Cycle Ultra Prime lap. Outside of the Pro races, several omnium competitions are still up for grabs as category Overall Leaders jerseys have yet to be decided. The Intelligentsia-WCJ Pilgrim Wire Juniors Cup, part of the USA Cycling Road Devo Series, also continues at the ISCorp Downer Classic. 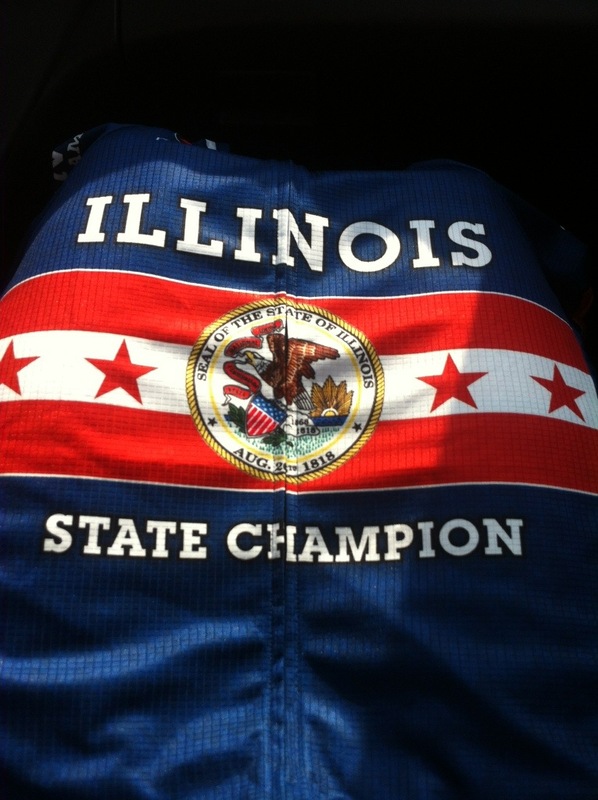 Nick Ramirez wins the Illinois State Championship! 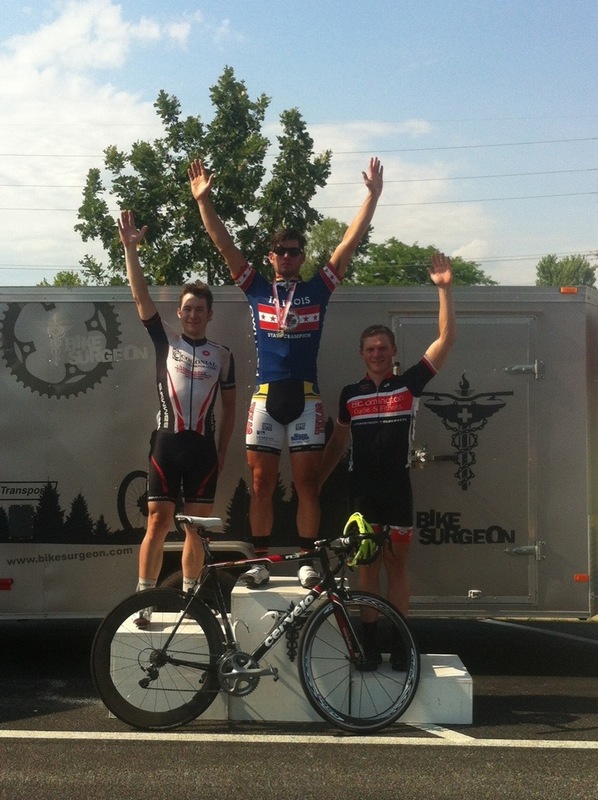 Great job today (June 8th, 2013) by Brian Baker, Lee Hauber and POD for going 1, 2, 3 today in Evansville, IN. Good luck to Nick in the Road Race today and Crit tomorrow. If you are around Galena, IL, stop by and wish Nick well.